Branch 1 of Karaj Revolutionary Court has informed Arzhang Davoudi’s attorney that his client has received the death sentence. According to the court’s ruling sent to Davoudi’s attorney, Vahid Meshkani Farahani, Arzhang Davoudi has been sentenced to death on charges of, “Membership in Mojahedin Khalgh (MEK) group and effective advocacy in advancing MEK’s goals from prison”. Political prisoner Arzhang Davoudi has already finished serving out his initial 10 years imprisonment sentence. However, while imprisoned he was charged and tried on additional charges and sentenced to 20 years plus 8 months imprisonment. Arzheng Davoudi, currently incarcerated in Bandar Abbas prison, can appeal this death sentence issued by the lower court. Branch 28 of the Revolutionary Court has sentenced 8 people to a total of 127 years of imprisonment on charges such as “assembly and collusion against national security, propaganda against the state, blasphemy, and insulting the heads of the three branches of the government and officials”. These individuals were administrators for several Facebook pages. They were arrested on warrants issued by the prosecutor last July. The defendants in these cases have been charged with various charges, but they all have been charged with the assembly and collusion against national security and propaganda against the state charges. 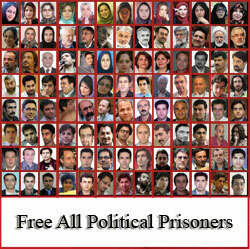 The cases of these eight people were first reviewed at Shahid Moghadasi court located in Evin prison. Indictments were issued and sent for trial to Branch 28 of the Revolutionary Court, presided by Judge Moghayeseh. The defendants are from various cities in Iran, including Yazd, Shiraz, Abadan, Kerman and Tehran. The trial of these defendants started on April 14, 2014 with the court issuing it’s verdict on April 29, 2014. Two of the defendants were sentenced to 18 years plus 91 days, and 19 years plus 91 days, respectively, as well as a fine of 1.3 million tomans and 50 lashes. The others were sentenced to twenty one, twenty, sixteen, fourteen, eleven and eight years of imprisonment. The cases of these defendants have been appealed but the Appellate Court which will review their cases have not yet been designated.